Most people associate slow cooking with using a slow cooker called "Crock-Pot," which is a trademarked name. Essentially, a slow cooker is similar to a Dutch oven, introduced in the colonial times and made of cast iron. 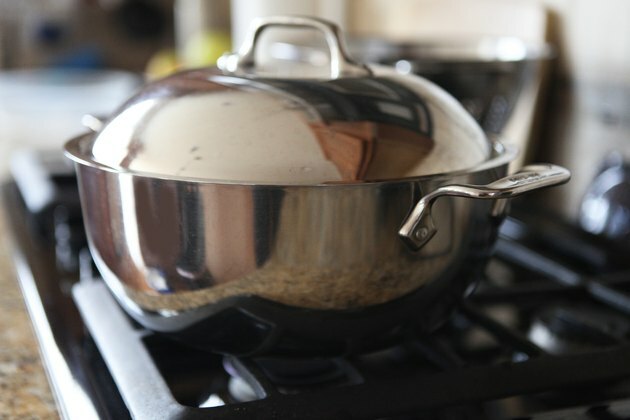 Using a heavy-bottomed pot, preferably a cast iron pot that distributes heat, you can slow cook on the stove. When using the stove top instead of a slow cooker, you need to make adjustments to the cooking times. The recommended cooking times are approximate, so keep your eye on the food as it cooks. Place a cast iron or heavy-bottomed, thick-walled pot on the stove burner. Add the ingredients to the pot and cover with a lid. If you are converting a stovetop recipe to a slow cooking recipe, reduce the amount of liquid ingredient the recipe calls for by 1/2. Foods often slow cooked include soups, stews and sauces, which call for a liquid ingredient such as water or broth. These foods become watered down when slow cooked because of the additional moisture created by steam. Set the burner on medium or medium-high heat. If you are using a large pot and the pot is more than 2/3 full, then turn the burner on medium-high heat. 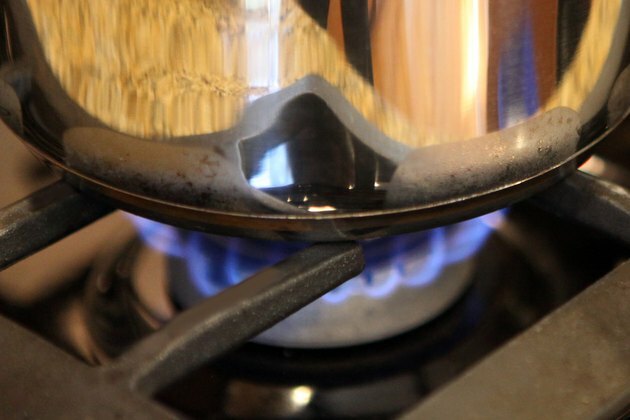 If the pot is smaller and about half-filled, turn the burner on medium heat. These heat settings are approximate. You want to monitor the food to make sure it doesn't boil. You only want to simmer the food, so lower the heat setting if food starts boiling. 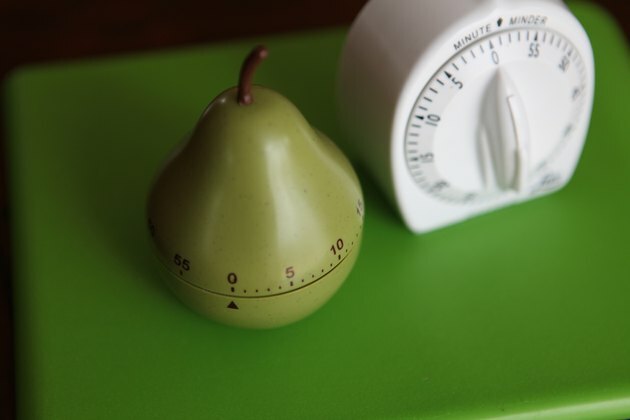 Anticipate cooking times and set your kitchen timer when recipes call for slow cooking. A slow-cooking recipe that calls for 4 to 6 hours on high setting or 8 to 10 hours on low setting is equivalent to 50 or more minutes of simmering on the stove. The University of Nebraska also recommends the following cooking times for slow cooking recipes adapted for stove top cooking: 1 1/2 to 2 hours high setting or 4 to 6 hours low setting is equivalent to 15 to 30 minutes cooking on the stove and 3 to 4 hours high setting or 6 to 8 hours low setting needs about 35 to 45 minutes on the stove. Slow cookers operate at lower temperatures, hence the time conversion needed when cooking on a stove. Compared to other cooking methods, slow cookers are safer to use. You can leave a slow cooker unattended while you work or play, provided that safety precautions are in place, but never leave food cooking on the stove top unattended. When slow cooking on a stovetop, follow the liquid requirements of slow-cooking recipes, because these recipes already compensate for the increased moisture. For any stovetop recipe that does not call for liquid, add 1/2 cup of water. Always refer to the user's operation manual for all cookware. OChef.com: Is Slow Cooker Synonymous with Crock-Pot?